Hear a pipe organ's inaugural concert this weekend at First United Methodist Church. Saltwater taffy, nutritional supplements, rocket motors ... and pipe organs. Yes, add the "King of Instruments" to the list of Made in Utah products. Michael Bigelow, founder of Bigelow & Co., builds those pipe organs for a living. 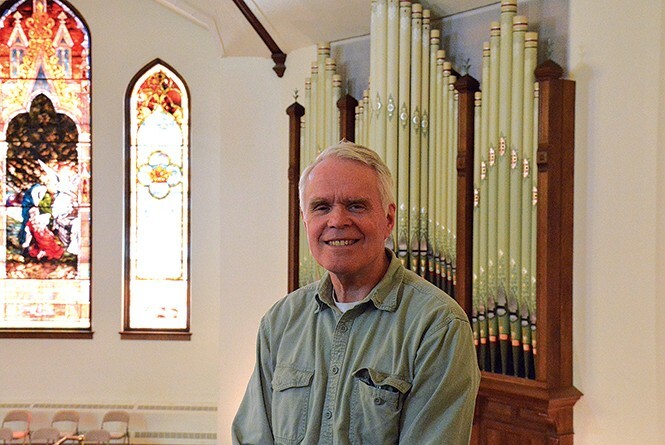 On April 8, Mormon Tabernacle organist Richard Elliott will play an inaugural recital on one of Bigelow's newly rebuilt organs at First United Methodist Church (203 S. 200 East, Salt Lake City). The 7:30 p.m. event is free to the public. Bigelow describes his craft below. When did you start Bigelow & Co.? Bigelow began business in 1978 in Provo. We moved to American Fork in 1984 to the surplus LDS Second Ward building dating to 1903. We've been here ever since. We have 10,000 square feet with five full-time and several part-time employees. Where and from whom did you learn organ building? When I completed training with Abbott and Sieker in Los Angeles and John Brombaugh in Ohio, I moved to Utah and set up my own organ-building shop. I've never done anything else. How many instruments has Bigelow & Co. built? We're currently completing our Opus 38, or in other words, our 38th instrument. The largest is Opus 17-56 ranks at Victory Lutheran Church in Mesa, Ariz. The smallest is Opus 4-3 ranks at BYU-Idaho in Rexburg. How many pipes in a "rank"? A rank of pipes numbers 56-61 pipes depending on the number of keys on the keyboard. Where can people hear organs with the Bigelow nameplate in Salt Lake City? There are three Bigelow instruments in Salt Lake City: St. Mark's Episcopal Cathedral (231 E. 100 South), St. Ambrose Catholic Church (2315 S. Redondo Ave.) and First United Methodist Church (203 S. 200 East). What is the price range on your projects? Most expensive was $1.3 million, and least expensive was $25,000. What's the most difficult part of building an instrument? The wind chests and pipes require the most labor, with the action and the casework a closed second. Then there's the wind system. How many hours are spent building an organ? We invested 21,500 hours on the instrument at St. Mark's Cathedral. Electronic digital organs are getting more and more realistic. They're not your grandmother's Hammond anymore. Will they ever replace real pipes? Electronic substitutes are already replacing pipe organs in many churches and other venues. However, it's been my experience that the vast majority of people can tell the difference and prefer the sound of a real pipe organ.